Where Presidential Candidates Stand On Climate Change : It's All Politics The majority of Americans favor government action, but the candidates — and big donors — differ greatly. Here is what they've said on the topic, beginning with whether climate change is real. 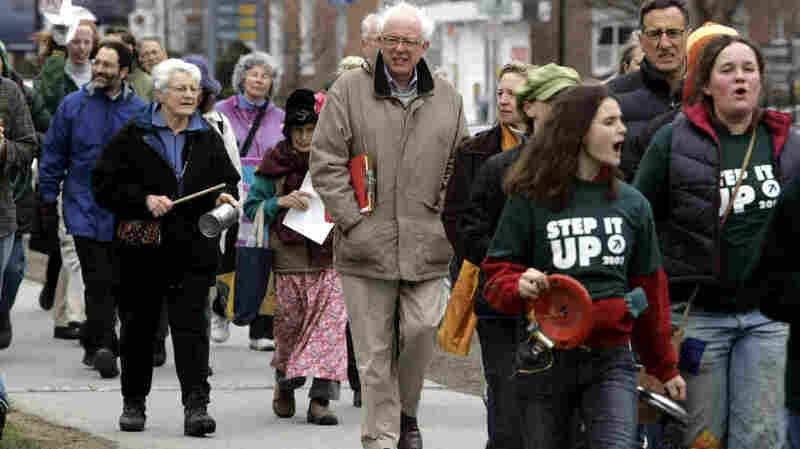 In 2007, Bernie Sanders took part in a Vermont walk for "Step It Up 2007," a movement aimed at reducing carbon emissions 80 percent by 2050. Last week, President Obama released a plan to cut carbon emissions from power plants. Climate change has also been cropping up on the presidential campaign trail — both Hillary Clinton and Bernie Sanders have released their own proposals. Nearly three-quarters of Americans now favor government action on climate change, but the candidates — and big donors who support them — still range widely in opinion. Some call it a hoax and oppose government action, while others have called for sweeping change. Sanders recently spoke at the Friends of the Earth Action press conference in New Hampshire, where he proposed taxes on carbon emissions and eliminating tax breaks for fossil fuel companies. Clinton set a goal to produce one-third of U.S. electricity using renewable sources by 2027. Among those who praised Clinton for her proposals was billionaire environmentalist Tom Steyer. Steyer, who spent $74 million in the 2014 elections to support Democratic candidates who made climate change a critical issue in their campaign, is reportedly preparing to spend another large amount this year. Donors on the left are not the only ones pushing for candidates to act against climate change. Republican businessman Jay Faison will put $175 million behind the campaign of a conservative who embraces the need to combat climate change, according to Politico. In early 2014, 71 percent of Americans said the government should do whatever it takes to protect the environment, according to a Pew Research Center poll. Though that number is higher among Democrats — 88 percent — 50 percent of Republicans also said the country should do whatever it takes to protect the environment. Those numbers have held fairly steady since the mid-1990s. "It's actually quite remarkable how stable opinions have been," said Jon Krosnick, a Stanford professor who has surveyed Americans about global warming for the past two decades. "The vast majority of Americans have said they think the planet's been warming over the past 100 years and attribute that, at least partly, to human activity as the cause." Despite the fact that the majority of Americans believe in climate change, only around 4 out of 10 Americans said Obama and Congress should view global warming as a top priority in 2015, according to a Pew Research Center poll. Most Americans thought the economy and fighting terrorism were top priorities. Krosnick said that, according to his research, candidates actually stand to gain by taking an environmentally friendly stance. "We're talking about a relatively small proportion of the population who will be influenced on this issue, but then again, as you know, elections are won by small margins," Krosnick said. But there is big money on both sides of the climate change debate, and perhaps even larger financial incentives for candidates to take an opposing view on climate change. Conservative billionaires Charles G. and David H. Koch, much of whose wealth comes from fossil fuel-related industries, unveiled their plan earlier this year to spend $889 million in the 2016 elections through their group Americans for Prosperity. This amount would dwarf what either of the presidential candidates raised in the 2012 general election, according to data from the Center for Responsive Politics. The Koch brothers, each worth more than $40 billion, have been public in their opposition to government intervention to combat climate change. The brothers successfully persuaded many elected officials — including presidential hopefuls Scott Walker, Ted Cruz, Marco Rubio and Rand Paul — to sign a pledge that would "oppose any legislation relating to climate change that includes a net increase in government revenue." Climate change policy could negatively affect Koch Industries' earnings — the University of Massachusetts Amherst's Political Economy Research Institute found that Koch Industries ranked among the top 30 companies for CO2 emissions in the United States in 2011. Last year, Koch Industries was the top spender for oil and gas lobbying, according to data from the Center for Responsive Politics: It spent $13.7 million. So, many candidates, finding themselves pulled in both directions, have opted to stay mum on the issue. But even those who have attempted to dodge addressing climate change have frequently been forced to take a stance when faced with a vote, signing a pledge or responding to a pointed question. Here is where each declared presidential candidate stands on climate change, according to our analysis of his or her most recent statements or actions.